Blog — Boutique Batik Fashions. Sad news my best friend Pak Heru passed away friday last 12th April. Together we helped each others businesses since the start in 1992. After my Java divorce in 2007 I stayed in his home in java. We have many memories together and I shall truly miss his wonderful demeanor. RIP. B.H.N.W.W. 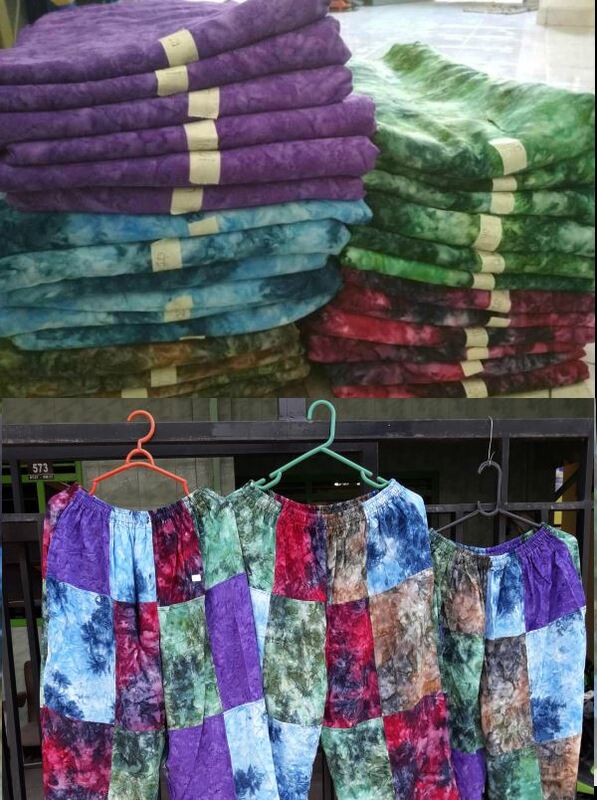 Currently we are making the “Classic” long dresses in Indonesia in the green and purple colours shown here, whilst in Thailand we have already made matching cream cotton jackets with embroidered X stitch. Many of our patchwork trousers customers will be pleased to see we are now preparing patchwork for 2019. Here are the standard colours for the first 200 pairs but of course not always in that order and with one more colour to alternate again. We always use the rugged french seam stitch for our patchwork trousers and coats. Yes the cloth breaks before the stitching!